U.S.-Turkey Standoff Over F-35 and Russia's S-400 Escalates Turkey is buying 100 F-35 jet fighters from the U.S. — and an anti-aircraft missile defense system from Russia. The U.S. says it cannot have both. A Lockheed Martin F-35 Lightning II stealth jet fighter on the tarmac at Luke Air Force Base in Arizona. Turkey's purchase of 100 of the advanced aircraft is at risk because the NATO member also intends to buy a Russian anti-aircraft missile defense system. At issue are two big arms deals being pursued by Ankara. Turkey wants to buy 100 F-35s, Lockheed Martin Corp.'s latest generation of stealth jet fighters. Turkey also intends to install Russia's advanced S-400 air-defense missile system. U.S. officials have told Turkey that it cannot have both. The S-400, they say, is designed to detect and shoot down stealth fighters like the F-35. Planting that air-defense system on Turkish soil could, by means of its powerful radar, help Moscow discover the secrets — and the vulnerabilities — of the F-35s that Turkey intends to acquire. The Trump administration tried enticing Turkey to scrap its reported $2.5 billion deal with Moscow by making a counteroffer: In January, U.S. officials let Ankara know it could buy Raytheon's $3.5 billion Patriot surface-to-air missile system at a discount valid until the end of March. But the offer also came with a catch. "We will only continue to discuss that potential sale to Turkey," Kathryn Wheelbarger, acting assistant secretary of defense for international security affairs, told Congress last month, "if it commits to not accepting the S-400." Turkish President Recep Tayyip Erdogan is showing no signs of yielding to the United States. He says he remains interested in getting the Patriot missile system but insists the S-400 deal with Russia is done and Turkey is not turning back. "Nobody," Erdogan told one Turkish TV interviewer, "should ask us to lick up what we spat." "This is a very rocky relationship," says Asli Aydintasbas, an Istanbul-based senior policy fellow at the European Council on Foreign Relations. As Erdogan frenetically campaigned across Turkey in the lead-up to municipal elections held Sunday, she adds, at "each and every rally he [brought] up S-400s, saying, 'We're going to buy it; they told me not to buy it' — almost making it look like it's a sign of his virility, his independence, his power on the world stage that he could say no to [the] United States." The Pentagon suspended deliveries for Turkey's F-35 program one day after its Patriot discount offer ended. 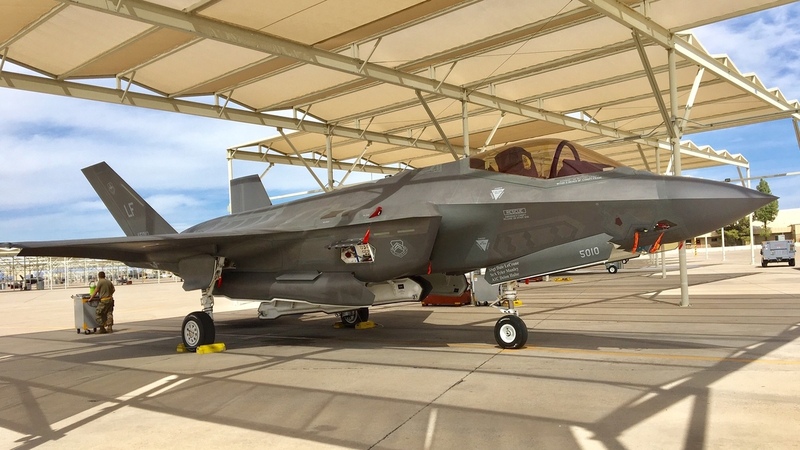 Last year, two F-35s were symbolically delivered to Turkey by Lockheed Martin in a ceremony at its Fort Worth, Texas, F-35 assembly plant. "At Lockheed Martin," Lockheed CEO Marillyn Hewson declared at the event, "our hope is that the F-35 will continue to strengthen the mission and the values of NATO, our relationship with Turkey and the cause of peace in the region and around the world." But those two warplanes are still in the U.S., at Luke Air Force Base on the outskirts of Phoenix. Turkish pilots have been training there to fly the F-35s, which are slated to be taken to Turkey in November. During a visit to the Air Force base, Turkey's two F-35s were visible, each with a Turkish flag painted on its tail. But no photographs were allowed of those warplanes; likewise, no interviews were permitted with the Turkish pilots training there. "The decision was made not for you, in this instance specifically," Luke's chief of media relations, Sean Clements, told me, "but just a blanket across-the-board that Turkey doesn't do interviews — they don't do, you know, media opportunities." Whether those two aircraft will indeed end up in Turkey appears less certain now that the Pentagon has taken its first concrete steps to curtail Turkey's participation in the F-35 program. "Should Turkey procure the S-400," acting chief Pentagon spokesperson Charles Summers said in his announcement suspending deliveries to stand up the program in Turkey, "their continued participation in the F-35 program is at risk." President Trump's nominee to be the next NATO allied supreme commander delivered a similar message at his Senate confirmation hearing Tuesday. "The S-400 and the F-35 are not compatible," Air Force Gen. Tod Wolters told the Senate Armed Services Committee, "and if Turkey proceeds down the path to procure and operate the S-400, they should not get the F-35." Outwardly, some U.S. officials remain optimistic. "I expect we'll solve the problem so they have the right defense equipment in terms of Patriots and F-35s," acting Defense Secretary Patrick Shanahan said at the Pentagon, at almost the same time Wolters was testifying on Capitol Hill. Last week Shanahan told Congress he wants Turkey to remain in the F-35 program. Some who have been following this standoff are convinced that is a near certainty. That would not only guarantee Ankara's planned purchase of 100 F-35s valued at around $100 million each but also ensure the continued supply of more than 800 components that Turkish firms manufacture for the F-35 as part of a nine-nation consortium. "Turkey was on board the F-35 program from day one," says Loren Thompson, CEO of the Lexington Institute, a public policy think tank that receives some of its funding from F-35 manufacturer Lockheed Martin. "Therefore, all of the program plans assume that it will continue to play its role going forward in the construction and support of the aircraft." Which is why former U.S. ambassador to Turkey Eric Edelman sees Erdogan betting on Washington backing down. "I think he might very well gamble that the United States would not actually kick Turkey out of the F-35 program," Edelman says, "because they are a partner in it and there will be some definite costs to the United States, both in financial terms and in terms of the program." Turkey has been a linchpin for NATO's defense strategy, allowing the U.S. and other NATO allies to use its bases and airspace for carrying out operations in the Middle East. Making Turkey ineligible for the F-35 could imperil that kind of military cooperation. "There are bad choices on both sides here, both for the U.S. and for Turkey," says retired Adm. James Stavridis, a former NATO supreme allied commander. "So far, neither side is blinking," Stavridis adds. "Let's hope the two sides can come together and hammer out some kind of a compromise that does not end up with S-400 missiles attached to NATO air defenses." The clock is running out for a solution to the impasse. Turkish officials say they expect to install Russia's S-400 missile defense system in July — nearly five months before their two F-35s at Luke Air Force Base are scheduled to arrive.